Forecast long-term oil shortages dampen need for new refineries. 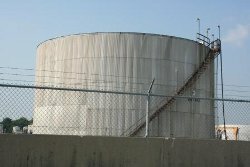 Oil companies won't be building more refineries, because there won't be enough oil left to refine by the time new refineries could pay for themselves. There hasn't been a new refinery built in the US since 1976. In 1982, there were 301 operable oil refineries in the U.S and they produced about 17.9 million barrels of oil per day. Today there are only 149 refineries, and they're producing 17.4 million barrels. This increase in efficiency is impressive but not a miracle. As with everything these outputs are carefully calculated to optimize profitability. Let me explain. Truth be told, new refineries require tremendous financial commitments which take anywhere from 15 to 25 years to amortize. With record oil prices it would make perfect sense to invest in a few refineries today, except... for the lack of oil to be refined 20 years from now. Trends have predicted that peak oil production, where the production of oil starts to decline, will be reached around 2007-2010. After that, there will be less and less oil to refine no matter where drillers look. In this context, building expensive new refineries does not make a lot of sense as existing ones will be sufficient to process whatever little oil is left. So forget about new refineries, except for a few in the northern midwest to process the heavy oil from Canada. Crude oil is a finite resource more and more depleted. As such, an increasing demand put on this finite supply necessitates careful management in order to stretch its lifespan and profitability.